They are the final line of defence in their respective teams and both played for Saint-Etienne. Coupet has gone on to become an international and one of the best goalkeepers in the world. They are also the two smallest shot-stoppers in Ligue 1... in terms of height. They are the final line of defence in their respective teams and both played for Saint-Etienne. Coupet has gone on to become an international and one of the best goalkeepers in the world. They are also the two smallest shot-stoppers in Ligue 1... in terms of height. How many derbies have Jérémy Janot and Grégory Coupet played in? Jérémy Janot has played in four matche with Les Vert against Les Lyonnais for one draw and three losses and eight goals conceded. He has only been up against Grégory Coupet in the OL goal. Grégory Coupet has played for both clubs. 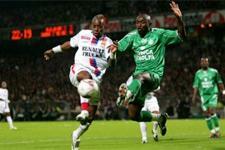 He played two games for Saint-Etienne against OL for one draw and a defeat, conceding two goals. His opposite number on both occasions was Pascal Olmeta. He has played eight matches with OL for three wins and five draws, conceding nine goals. He has played four times against Janot, three times against Alonzo and once against Levytsky. Janot played in his first derby on December 21, 2000 ; Coupet played in his first derby on March 4, 1995. OL were head and shoulders above Les Verts on Saturday, running out 4-0 winners. It was the side's 24th win this season and took them to 81 points on the ladder with two games left. They lead second-placed Bordeaux by 16 points. “I’m signing on for another four years with OL”. Sunday, April 30 at 23:40, François Clerc announces he has agreed to extend his current deal. ‘Happy’ and ‘proud’, Lyon the right-back revealed just how happy he was to be staying at ‘his club’. Check out the champions’ reactions to the match between OL and Saint-Etienne.